Thursday afternoon. It's sunny. People are out. It's winter-coat weather, but not for me. I feel lucky, rather free. Here on Bloor Street, at a time when the westerly sun streaks through, all appears so perfect. People are out and about. Not all carry happiness with them, though. Some look glum. An elderly woman struggles with every step, with stick in one hand and hope in the other. Some are aware of their surroundings. Others are in a chat with someone elsewhere, with wires protruding from their ears. They are in another zone. There are hipsters. There are the ordinaries. Some carry bags of groceries and bags of commodities of anything under the sun. Some bring along pet dogs, or perhaps it's the reverse. The odd pigeon lands, gyrates, poops, then takes off. One man recognizes us, perhaps others too. It was obvious from him. 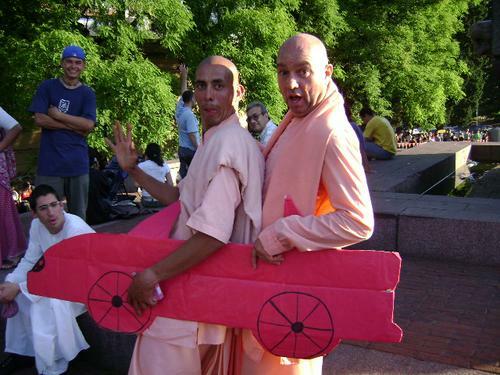 He said, "Hare Krishna," with the biggest grin—and nod. A beggar woman expressed a desperate look all over her face. A beggar man expects compassion from us—from Connor and I. Well, we were dressed as if we were givers, with devotional stuff on, beads, and me with robes, dhotiand kurta. I take my japabeads and hold them in the air as if to say, "This is all we've got. Depend on the spirit." 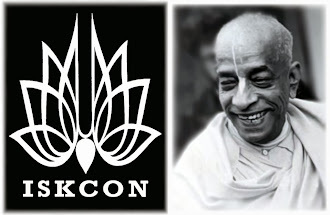 I am a disciple of A.C. Bhaktivedanta Swami Prabhupada, and I became a monk of the Hare Krishna order in 1973. My teacher gave me the spiritual name, Bhaktimarga Swami, which means "the path of devotion". Of course, this fits right in with my avid promotion of walking adventures as a way to connect with the Divine and lead a more care-free / car-free lifestyle. It is a great joy to share these adventures in both Canada and abroad with you via my daily blog. FOR MORE INFORMATION PLEASE VISIT MY WEBSITE AND FOLLOW ME ON FACEBOOK. * PLEASE INCLUDE YOUR EMAIL ADDRESS IN ORDER TO RECEIVE A RESPONSE.